I’m super-awesome because I just resisted a very tempting elann.com update. Naturally Natural Wool 200g hanks under $5 in both aran and DK. And you know how much I love the natural browns. And earlier this week, I resisted this very cute tablecloth on clearance at Target even though I was dying to buy it for a circle skirt. But I’m prohibited from buying any clothing this year, and that includes tablecloths! But I could hear the cogs creaking in my brain trying to rationalize that one. Instead, I’ll see if I have a cute vintage tablecloth in my stash I can use for a circle skirt. 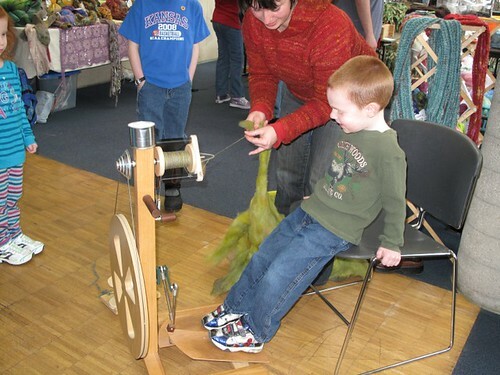 Today one of the Kansas Day organizers sent me this great pic of me tandem spinning (me drafting; someone else treadling) with some cute random kid. I’ll bet I did this with 50 different kids that day, including a couple who were so little they had to hold onto their parents’ knees and run in place on the treadles. Yes, that is my ghetto tin can cupholder. I totally covet one of these (with the slotted option for my coffee cup, natch), but my birthday is not til September, so it’s all travel mugs and Diet Coke cans for me right now. Good for you for showing some restraint. So not buying cheap wool that you like can actually be done, lol! I need to start trying that. Previous PostPrevious New Clothes for the Thrifty Critter!